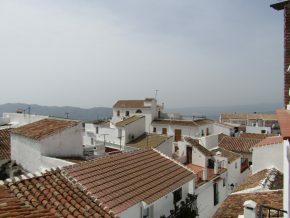 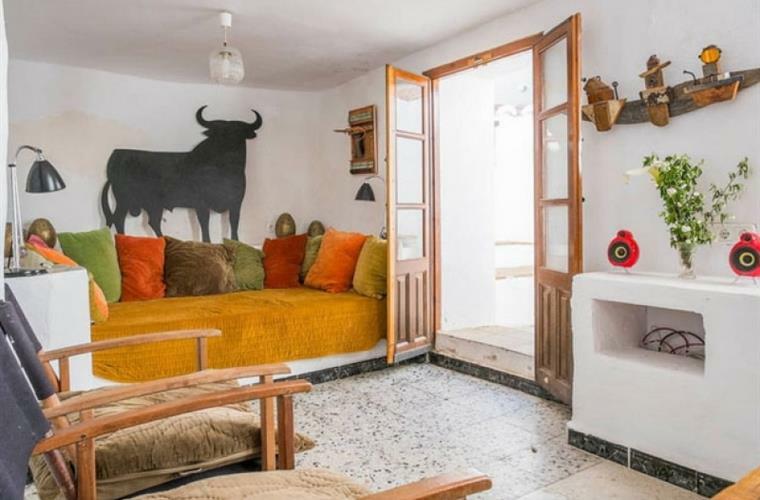 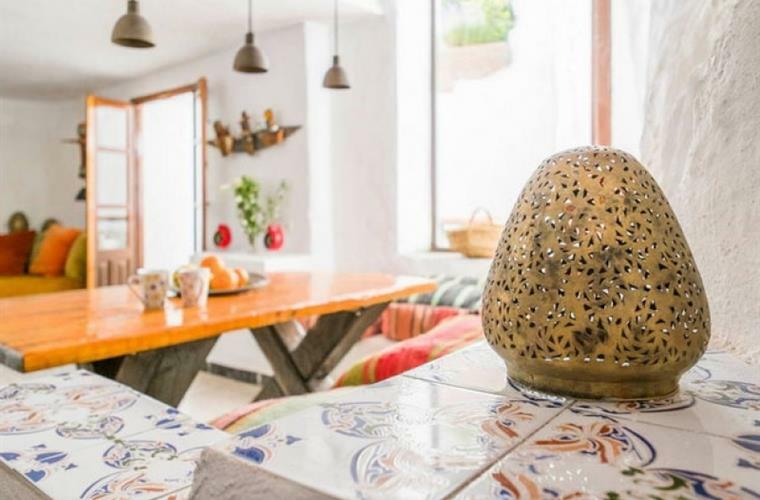 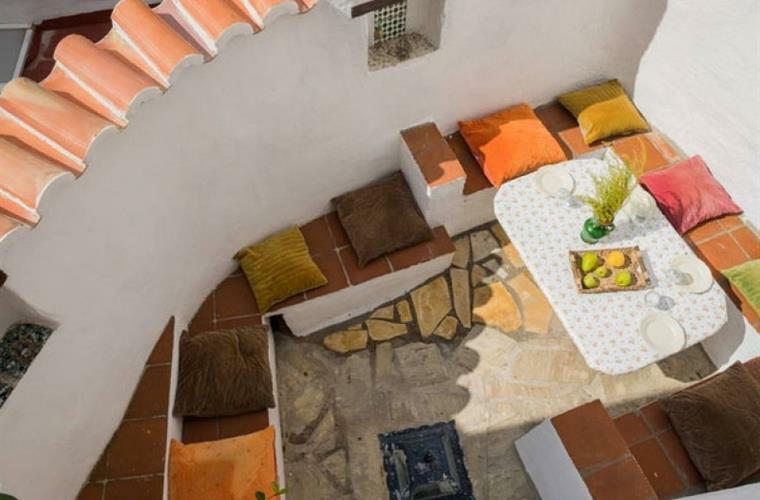 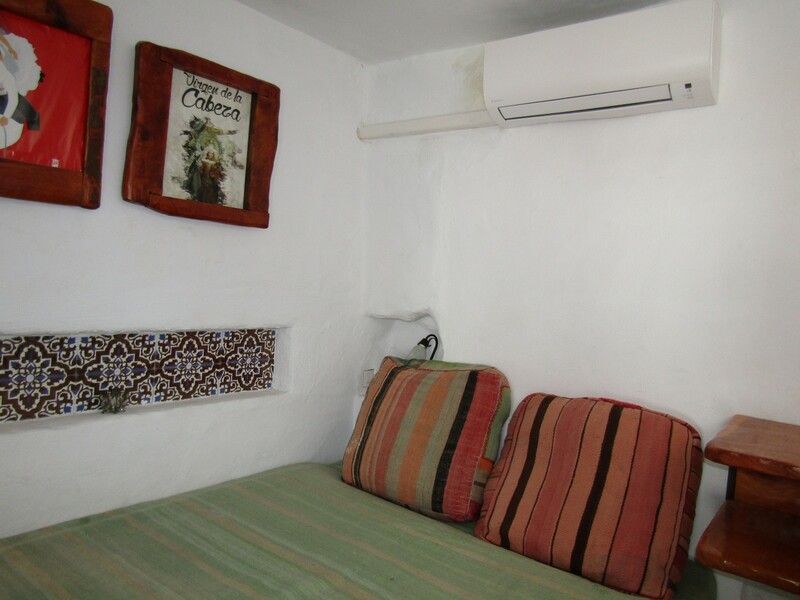 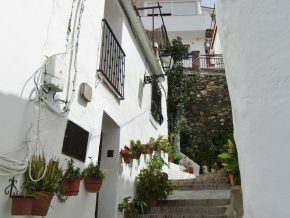 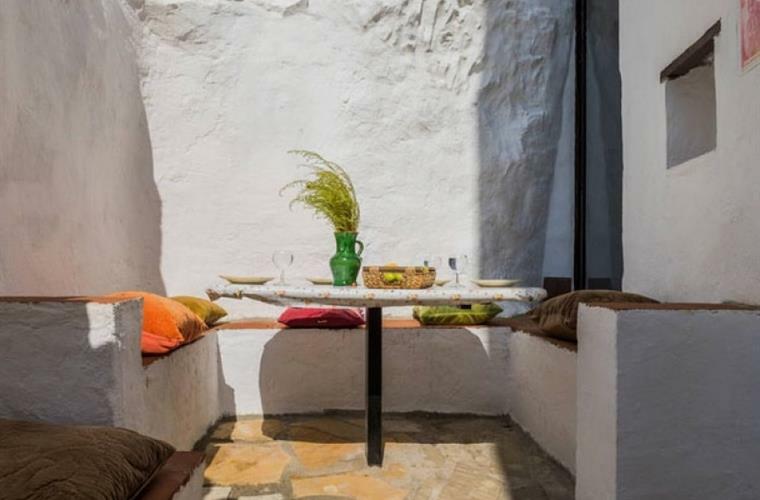 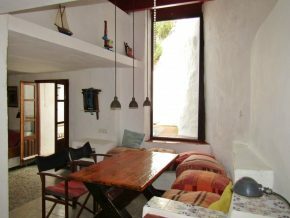 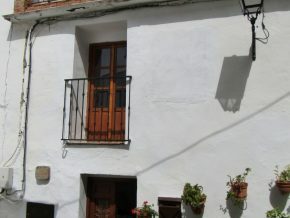 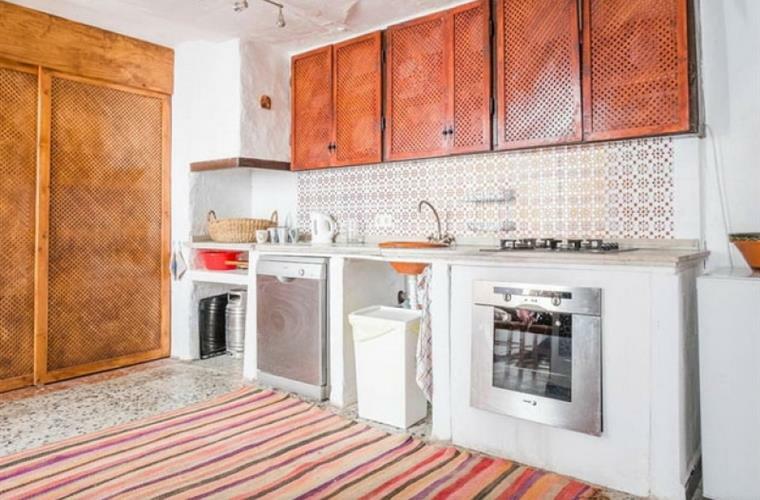 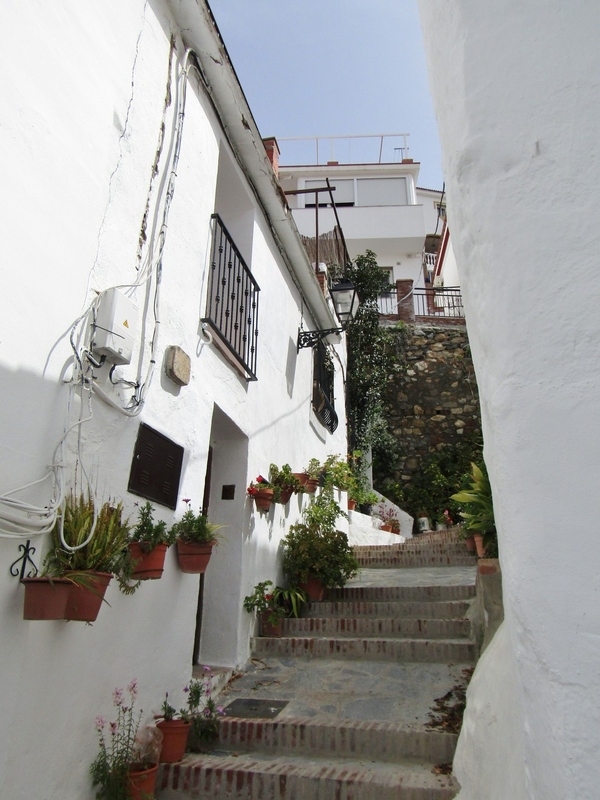 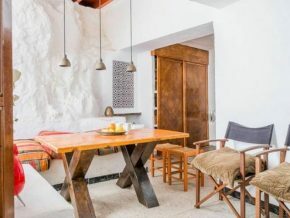 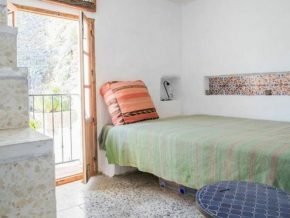 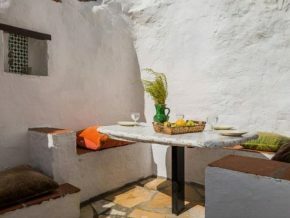 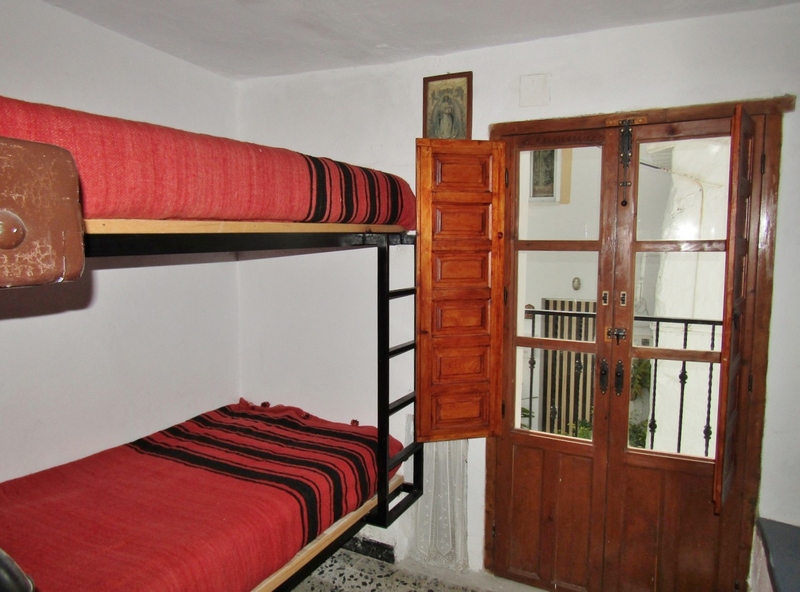 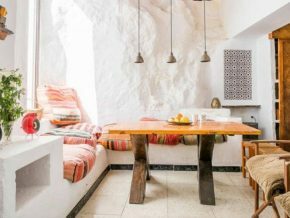 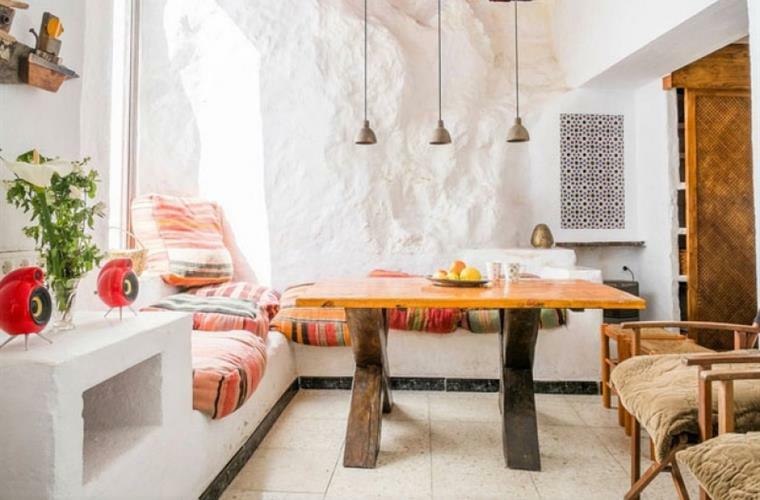 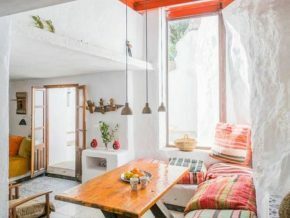 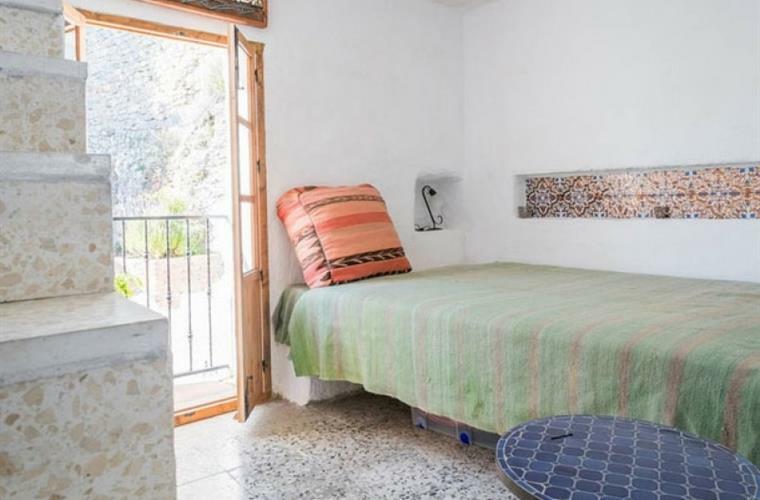 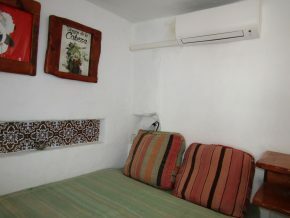 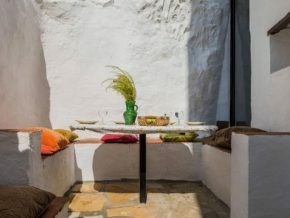 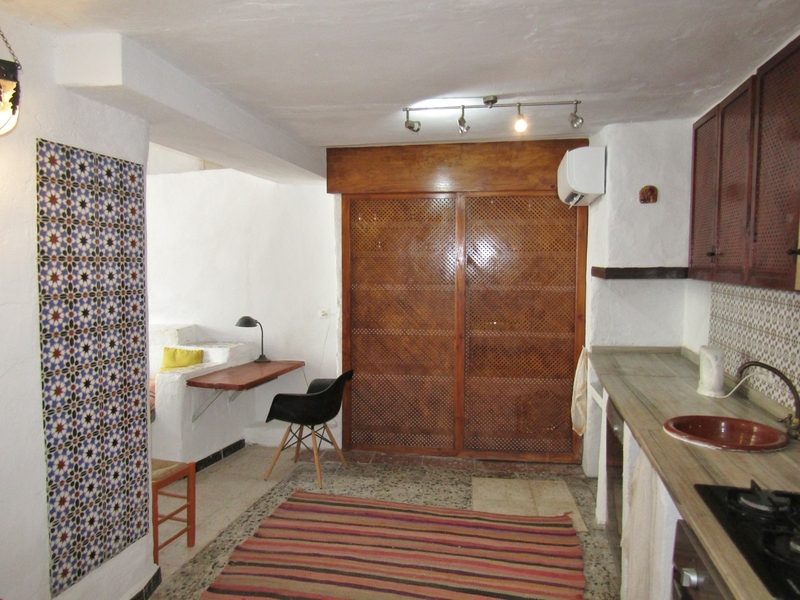 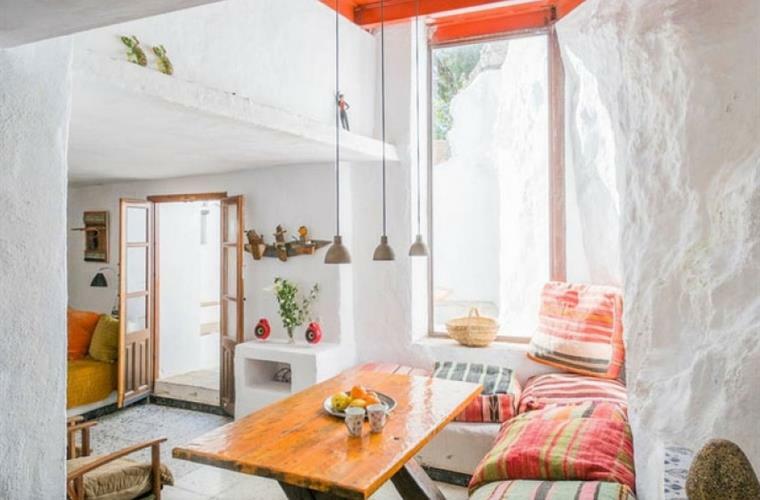 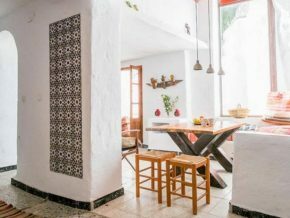 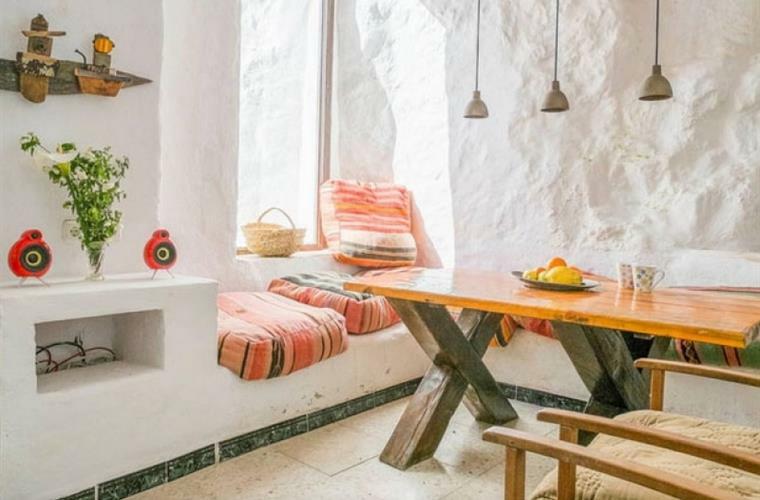 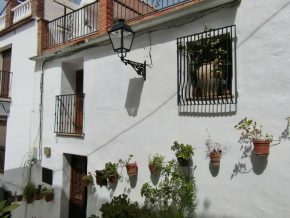 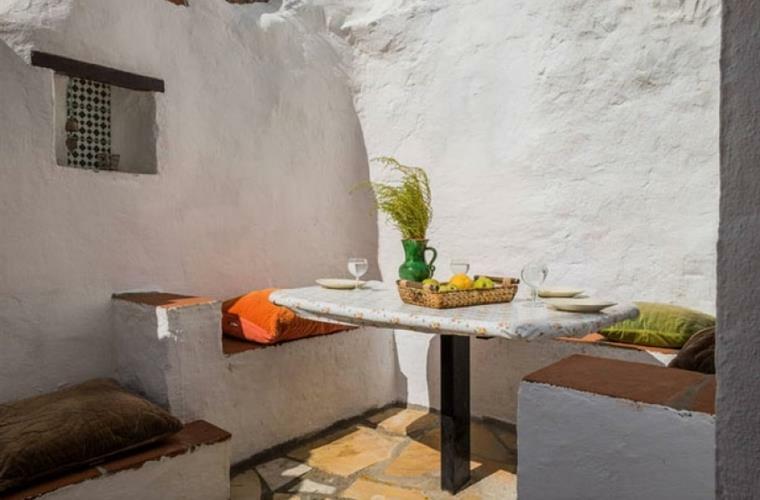 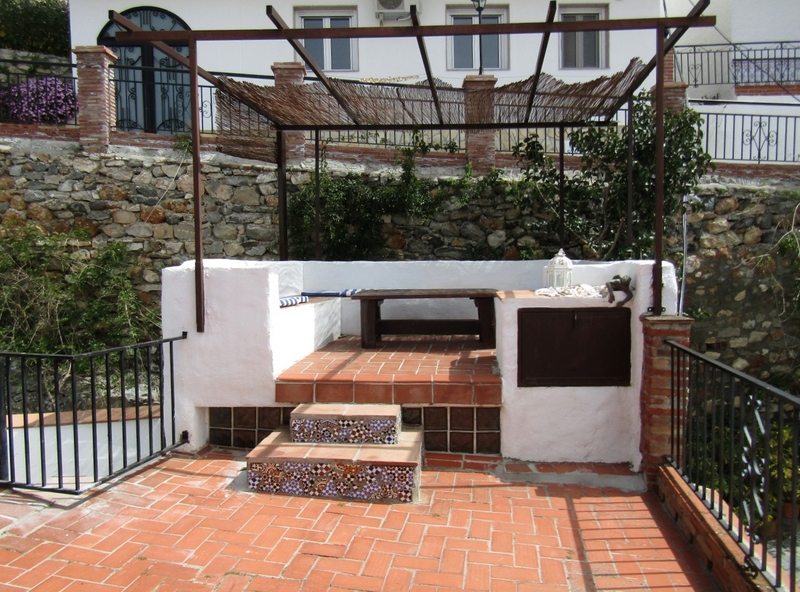 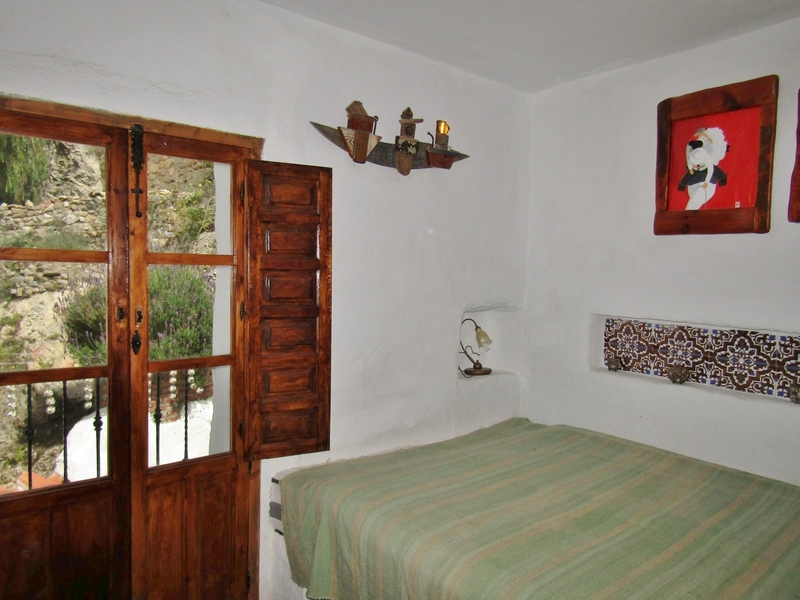 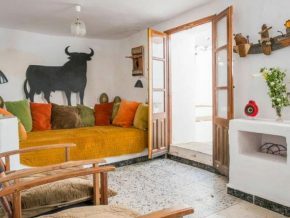 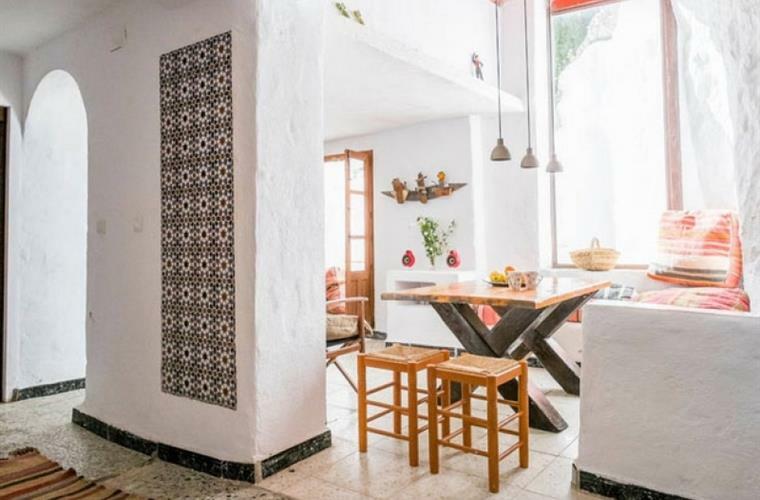 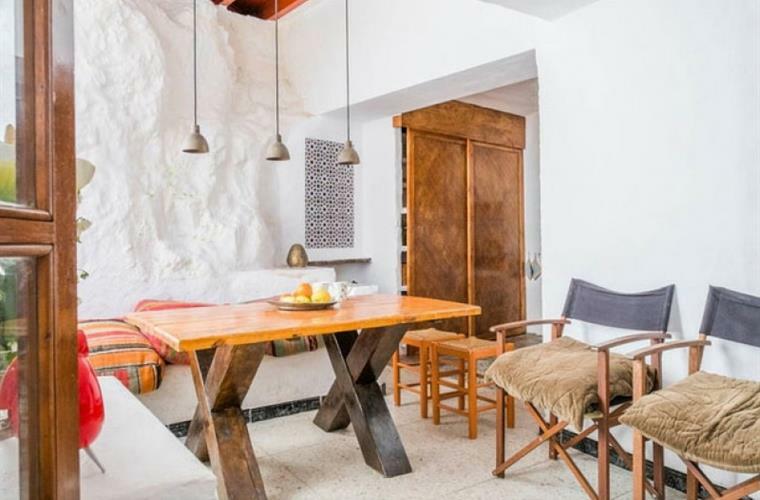 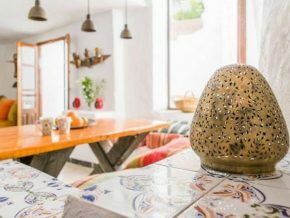 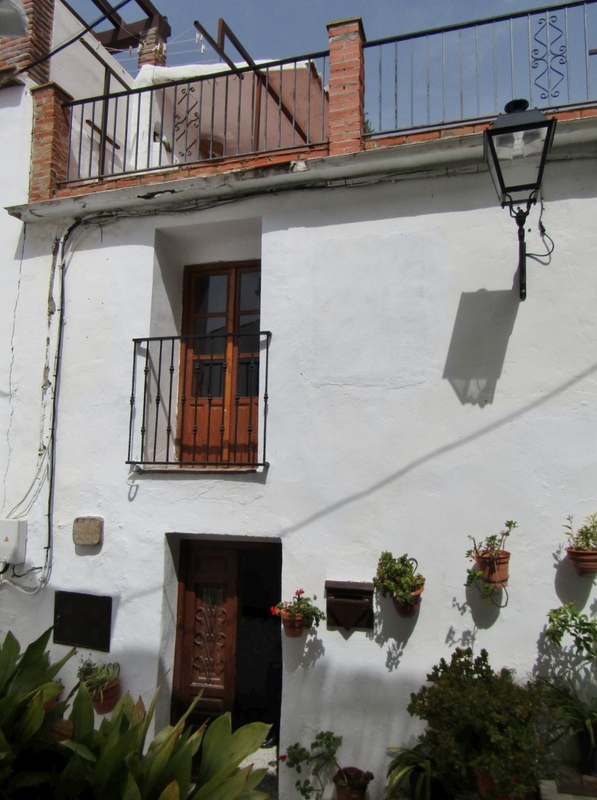 Located close to the main square, in a quiet street, this little house is currently used for holiday rentals and would make a perfect base for anyone wishing to regularly stay in the delightful village of Canillas de Aceituno and explore the interesting mountains around. 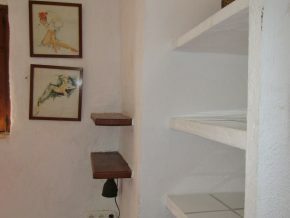 The front door leads into a small hallway, with stairs leading up immediately ahead, and the open plan kitchen/dining/living room area to the right. 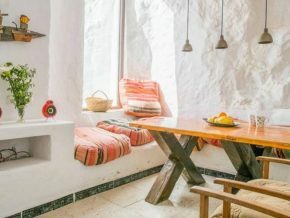 The kitchen (6 x 3m) is fully fitted with window to the front and leads into the living/dining room area, (5 x 2.m) with a large picture window, built-in seating area, and double wooden doors that lead out to a patio area, incorporating the natural rocks of the terrain, making this very much a feature of this house. 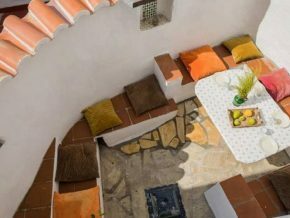 The patio area is around 4 x 2m with built-in seating. 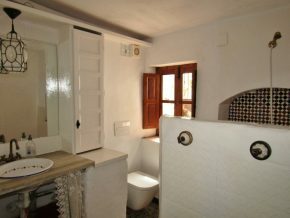 To one side is the WC. 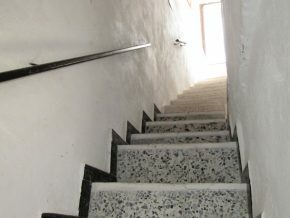 The stairs lead to an open plan landing of around 3 x 2.5m, plus under-stair alcove area, which can be used as an additional living room area, or, as at present, as an area for an extra bed. 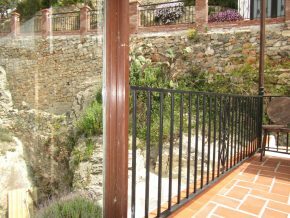 Double doors lead out to a balcony overlooking the rear patio. 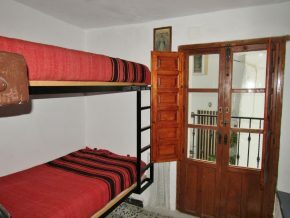 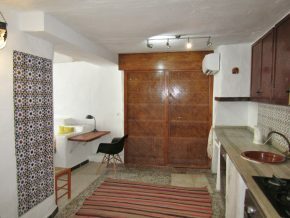 To the right is bedroom 1 (2 x 2m plus built-in wardrobe) with double doors onto a balcony overlooking the street. A short corridor leads to the bathroom with walk-in shower (2 x 2m) and to bedroom 2 (3 x 2m). Stairs continue up to a huge picture window bringing in plenty of light, and a door leading out on the roof terrace. 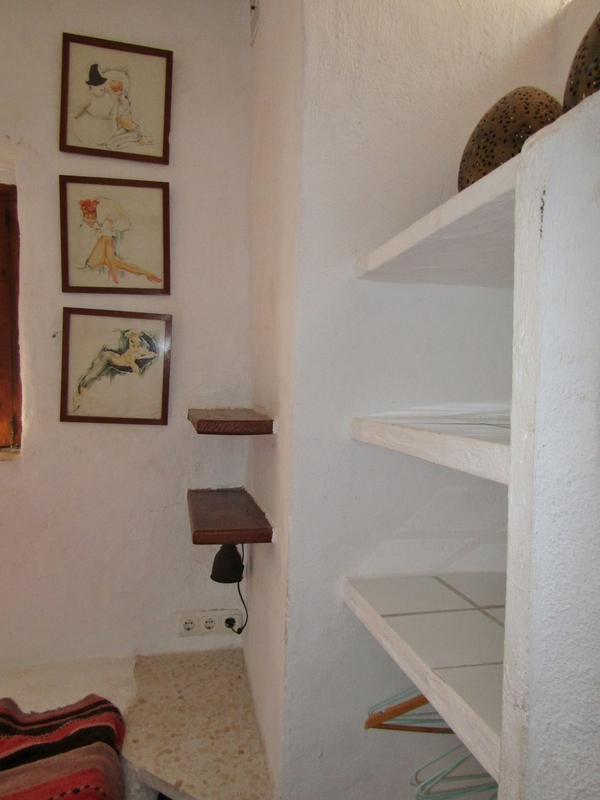 This space is 3 x 2.5m plus 6 x 3.5m, plus three steps lead up to a seating area of 3 x 2m. 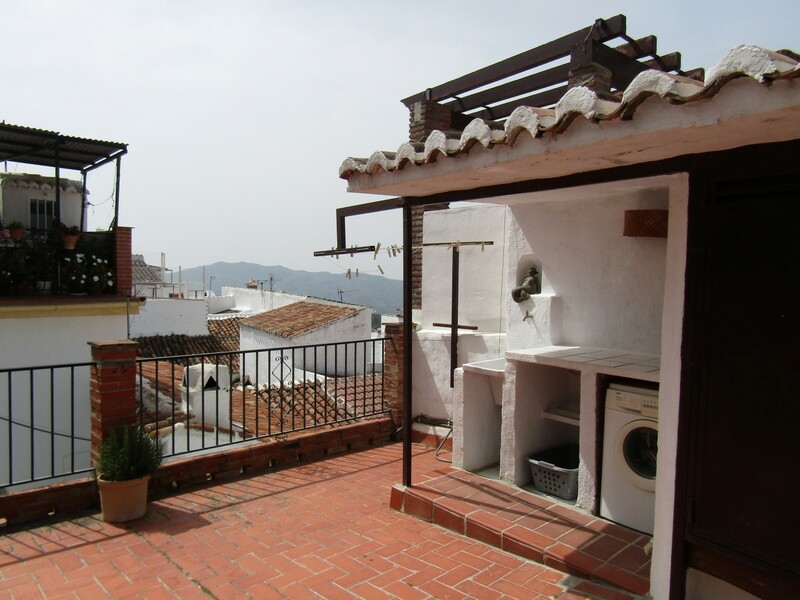 There is a washing machine and barbeque and store cupboard on the terrace. 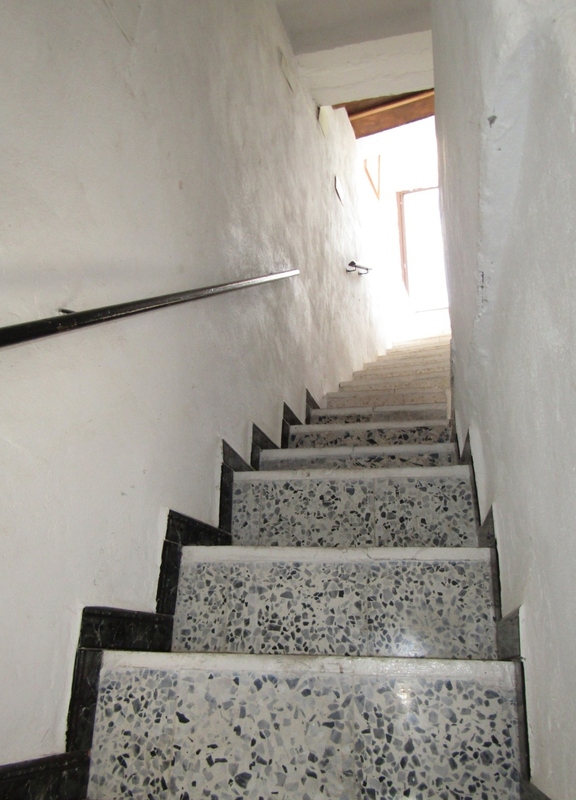 An additional, smaller, tiled area is below, accessed via a ladder from the terrace. 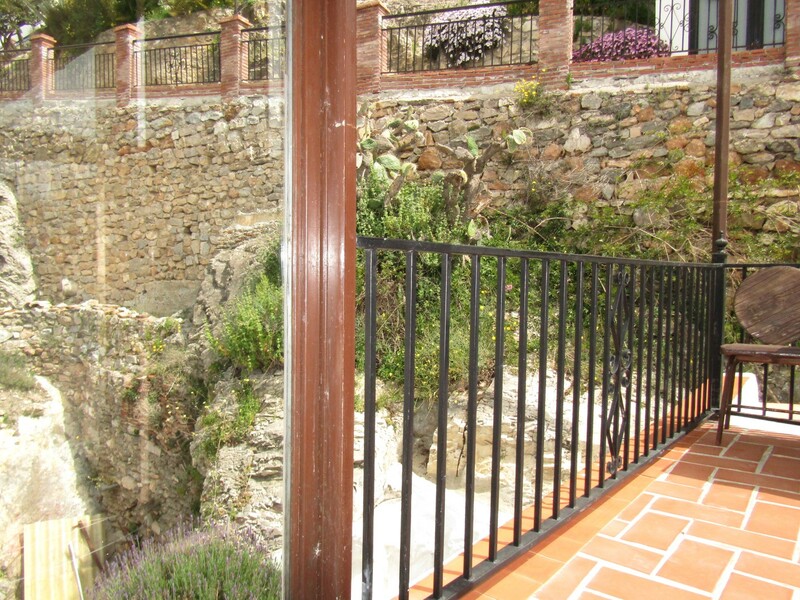 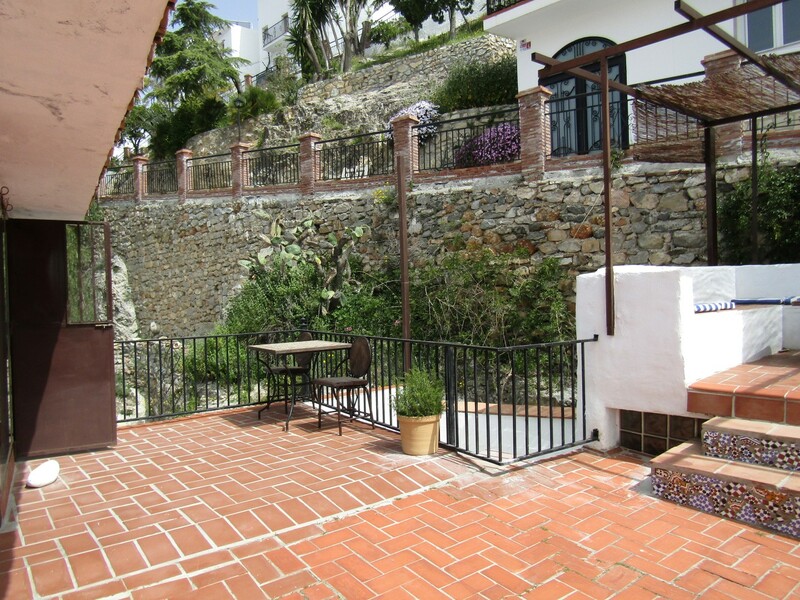 The terrace is very private and has pretty views over the village and countryside. 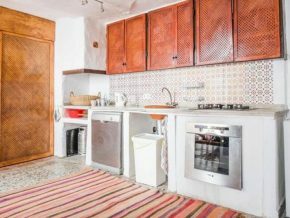 – Council tax/IBI: 120€ p.a.